Renegade's BS: The Sun in 3D! 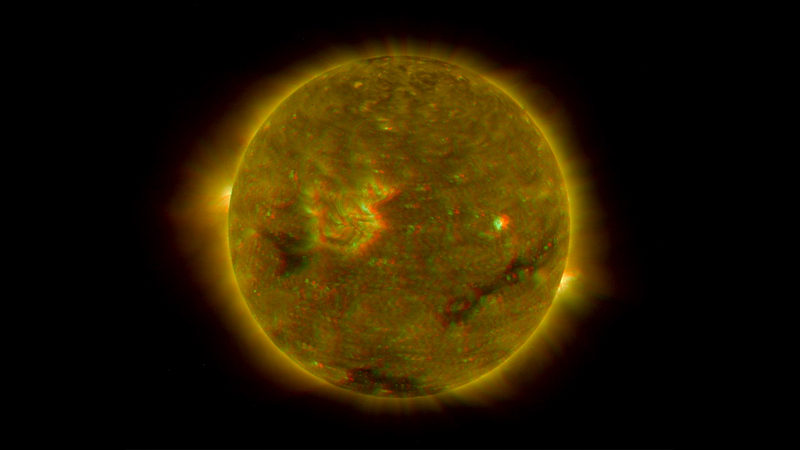 April 23, 2007 — Break out those 3-D glasses and get ready to see the sun in a whole new light. NASA released the first three-dimensional images of the sun ever compiled, a feat made possible by the agency's twin Solar Terrestrial Relations Observatory (STEREO) spacecraft. Like a person's two eyes providing depth perception, the two spacecraft orbit the sun at a set distance from each other to offer a stereo view. "The improvement with STEREO's 3-D view is like going from a regular x-ray to a 3-D CAT scan in the medical field," Michael Kaiser, STEREO project scientist at NASA's Goddard Space Flight Center, said in a press release. Until now, 2-D images of our star (such as the one at top) have allowed scientists to see the sun's weather, but the flat views made it difficult to decipher the exact motion of solar eruptions and the distance they spanned. Understanding the sun's physics is critical, scientists say, because especially strong events called coronal mass ejections create radiation storms that can disrupt satellites and radio communications and can even knock out power grids on Earth. The new 3-D images (such as the one at bottom) will help researchers better track these ejections—like meteorologists tracking hurricanes—and thus predict when and where violent storms are headed. "Previous imagery did not show the front of a solar disturbance as it traveled toward Earth, so we had to make estimates of when the storm would arrive," STEREO investigator Russell Howard of the Naval Research Laboratory told Space.com. "These estimates were uncertain by a day or so. With STEREO, we can track the front from the sun all the way to Earth and forecast its arrival within a couple hours." I broke out an old pair of 3D glasses and checked out the images... AWESOME! These satellites have delivered more than I expected they would when they were launched last year! I'd be very interested to see images of Earth if they would develop Earth Stereo satellites! Be sure to check out all of the Stereo images at the NASA website.